Disclaimer: this post contains affiliate links of companies that I use and recommend. Although it may not be typical, you can go from $2 to over $500 in just a few months if you continue to do these things. We have seen our own blog’s earning increase dramatically through the steps that I am going to share with you today. 1- The only (legal) way to increase your earnings is to bring in more traffic. I know that there are ways to get only the high-paying ads, but I don’t recommend it because I don’t think that they follow Google’s rules. Better Pictures- if you don’t have pin-worthy pictures, your page and post will be overlooked. I can promise you that. Every picture can use a bit of editing! 2. If you are trying to make more money per click, make sure that your Ads are Targetable. On Google Adsense, you need to make sure that you have Targetable Ads. (see how I added one from my custom channels)? – You will want to track your ads to see which ones make money. My best money-maker, by far, is the one that I have on the top of my blog. The widget area is “site-wide top” – it is at the top every post & page. You can see it here (it is the square above the posts. You can see my other ads, too). My other ones make a little bit, but no where close. to this. 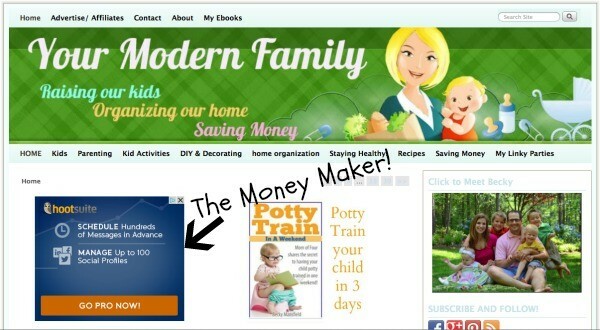 PS- THE POTTY TRAIN PIC IS MY OWN BOOK & POST, SO IT IS NOT ANOTHER ADVERTISEMENT. 3- Keep it above the fold (this means that it has to be seen when you first click to your page. This is the first thing that you see (“above the fold”). Google doesn’t want them below your posts or in your footer or low in your sidebar. They want them to be seen right away.Google Adsense is one way to make money on your blog. I also do several sponsored posts every month. (Here is how to write a sponsored post). Sponsored posts can bring in several hundreds to several thousands of dollars per month. I highly recommend signing up with Izea and Sverve. (Find a master list of where to find sponsored posts here) These have been my highest-reffering companies. I continue to get jobs from them every day or every few days. The price ranges from $5 to $800 per job and more! Just sign up for them and they will send you e-mails with new leads or campaigns.I hope that helped! Between the new companies and utilizing google adsense, you will be well on your way to making your blog a financial benefit to you and your family. UPDATE: Check the ad size- See the link that Sarah shares in the comments section- great advice!What tips do you have to share about how to increase google adsense earnings on your blog? Greta link on which ones to go for 🙂 I saw our revenue for our three sites go up within just days. I have such trouble putting ads up top. Is it at all possible to still make a reasonable income with ads at the bottom of the page, where I’d rather they be? It still makes money, but you won’t get nearly anywhere as much. Take a look at my sidebar main ad – I think it blends in nicely and doesn’t look tacky – or take over my site. I personally hate sites with full width banners across the top of their sites. Thanks for the info! I just signed up with sverve. Do I need to follow other people to get picked for jobs? Not sure how this works. I do. I follow them & they will follow back most of the time & endorse you (that shows the advertisers that they are saying “pick her!” . I’ll follow you back. (I just get on every day or so & see who my followers are & click “follow’ on their pages, too. Another thought that has helped my Google Adsense clicks is putting 5 links in my post to other relevant posts on my blog. That helps keep each person on the blog a little bit longer and raises the chances of them clicking. Also, keeping popular posts in the sidebar can also tempt people to stay a little longer and look around. Great tips Becky! I just resized my header this week so my ad would be above the fold. I thought you either had a pretty header or an above the fold ad…I realized you can have both! I was turned down by Google Adsence…not enough followers? I absolutely love your blog and have been following now for a while. I am new to blogging and trying to get as many tips as possible. I found your blog and posts the best I have come across. So firstly thank you ! I too have been turned down by Adsense …. the reason given was ‘content’ …. not enough text and too many pics ! Would love some advice on what to do now. They said to try again when I have it ‘sorted’. Does this mean I can go back and remove photos, add text etc. or does it mean from hereon in to concentrate on more text ?? Its not very clear. I would really appreciate some help here. Many thanks. ps the photos are VITAL to the blog …. and Im wondering how do photography blogs work around this?? Hi there, You have executed a wonderful job. I most certainly will definitely stumbleupon it as well as in person recommend in order to my buddies. More than likely they’ll be took advantage of this amazing site. Fantastic article – printed out to go through more thoroughly! I am in the process of testing this on my site. I am not sure if users would actually like such a prominent ad space BEFORE the post text but we will see how it performs. Thanks for the tips! I’ve been blogging for 5 years and never activated adsense because I wanted to be able to control the ads on my site. I guess I should look into it a little more. Definitely checking other links. Hi Becky, can you please explain what “targetable” ads are. Thanks! So when you go to MY ADS & you click on Create New Ad Unit & you have to make them custom. Once you do that, you should see a box that lets you target them. It should be under REPORTS. I label mine: “TOP OF BLOG” “BOTTOM RIGHT”, etc… so I can see how much each one makes. I label mine when I make them “Top right ad” “Bottom horizontal ad” & then I can tell which one is making the most. Yes! Finally someone writes about black friday deals. i have gone through this article and very informative. I believed this publish used to be great.